Paint, ink, distress... and trade! 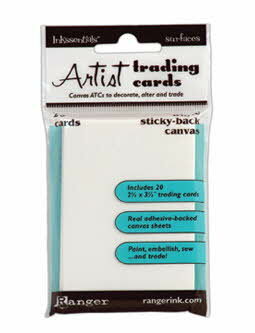 Artist Trading Cards (ATCs) are miniature pieces of art meant to be given away or traded. Each Inkssentials Artist Trading Card package includes 20 2½" x 3½" trading cards. These white mini canvas sheets accept all types of mediums and the glue backing stays sticky even after using wet media. Use with Claudine Hellmuth Studio paints, inks and more.